If I had my choice of desserts, pineapple upside down cake would not be at the top of my list. Well at least it wasn’t until I made this cake. 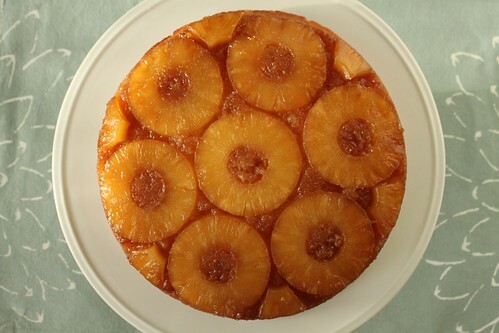 If you think like me, you might think that pineapple upside down cake is stuck in the 1980s. While I must admit that the ho-hum yellow-tan color occasionally mixed with the bright red of a maraschino cherry is somewhat unappetizing and does indeed remind me of 1980s wallpaper, I must give some respect to the deliciousness that is this cake. I made this for my dad’s birthday because for as long as I can remember, it has been his favorite cake. Perhaps this is because I was raised in the 80s, at a time when yellow-tan was in style. Or perhaps my dad has not ventured out into the world of other cake flavors. But most likely I think that my dad just realized that this is a simple cake base that could be eaten on it’s own, combined with a pineapple-carmel syrup that is to die for. When I decided that I was going to make this for his birthday, I searched high and low for what I thought would be the best recipe. I have made a few pineapple upside down cakes in the past, but I wanted something that would be truly exceptional. While I am not normally one to alter a baking recipe much from the original, I had to make an exception for this cake. I ended up combining the best parts from 2 separate recipes so that I could get a rich cake that would fit in a 9-inch pan and not use the entire pound of butter. I think it turned out to be a success. The cake has a rich and nutty flavor and is so moist in part because of the sour cream and pineapple juice and in part because of the rich syrup sauce it is drenched in. Of course the pineapple itself is on the of the best parts, so feel free to use real pineapple if you have it handy. I have a feeling that I will be making this around September 1st again next year :-). 1. Heat brown sugar and butter in a saucepan over medium heat until bubbling (several minutes). Remove from heat and pour mixture into a non-stick 9 inch cake pan. Place slices of pineapple over the sauce, cutting pieces as necessary to fit as many as possible. 2. Preheat oven to 325º. 3. Whisk flours, almonds, baking powder and salt in a medium bowl. In the bowl of a mixer blend sugar and butter. Add eggs, one at a time and then mix in vanilla and pineapple juice. Once blended slowly add the flour mixture, alternating with the sour cream. Batter will be thick. 4. Pour batter on top of pineapple slices in pan. Bake at 325 for 50-60 minutes or until a toothpick inserted in center comes out clean. 5. Cool for 5-10 minutes and then invert cake on a rimmed plate to insure no juices are lost. Serve warm or refrigerate for 1-2 days before serving. This entry was posted on September 4, 2011 by Spice Is Nice. It was filed under Cake, Dessert and was tagged with Cake, Fruit, Pineapple. This to me is “comfort food.” I love the beautiful caramel color and the fact that you can eat this one warm! I have heated it after a day or two in the microwave. Great recipe too! I just look to see what you are making and then I make most of your recipes. Love your choices!! Hey! I believe Lydia may have texted you yesterday…we grew up together, and she was commenting that we needed to meet since my husband and I just moved to Perrysburg, I am 1/2 Lebanese, and I have food blog (that badly needs to be updated). Anyways, she sent me the link to your blog which I’m now adding to my Google Reader – beautiful pictures! 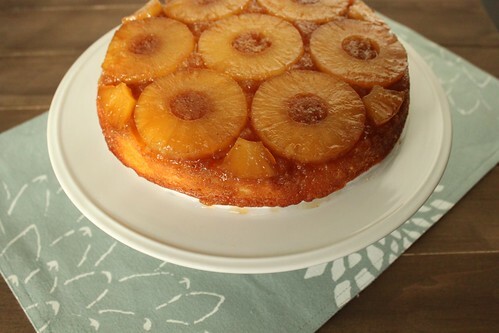 – but I had to laugh, because I also just made my dad pineapple upside down cake for his birthday! Hi Pamela! We should totally get together – perhaps we can do one of those cook together and then blog about it things :-). Hope to see you soon! This recipe is to die for! Everyone loved it. I subsituted sour cream with greek yogurt and 1 1/2 cups of all purpose flour. Soooo good!